Brain-computer interfaces are a pretty incredible (if slightly unsettling) thing. 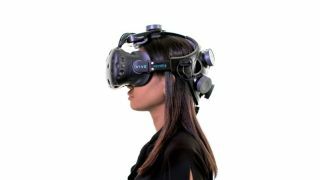 The idea of a computer being able to measure your brainwaves and then act upon them feels distinctly sci-fi, but that is exactly what VR startup Neurable has accomplished. Displaying at ‘computer graphic and interactive technique’ conference Siggraph in Los Angeles, the Neurable headset allows users to select from a number of objects hovering in front of them in a VR environment using nothing more than thought. This is accomplished through the use of an upgraded headband for the HTC Vive that has a number of sensors that monitor brain activity. The user is shown a collection of images, has to choose one of them, and then from measuring the brain activity as each object flashes, the correct object floats towards the user. If you’re anything like us you’re probably thinking that it’s all well and good for a company to claim these things, but it’s a different thing to actually make it work. Well, it seems that it does work. Moving on to the game, he found that he was able to lift object by just thinking the command ‘grab’ and then throw them at the killer robots. As this is just a startup displaying a proof of concept, there’s no immediate timeline for the device coming to market, but as always we’ll let you know more as soon as we do.